Biologic drugs targeting immune cells or cytokines underlying systemic inflammation have dramatically improved outcomes in patients with rheumatological and autoimmune diseases. 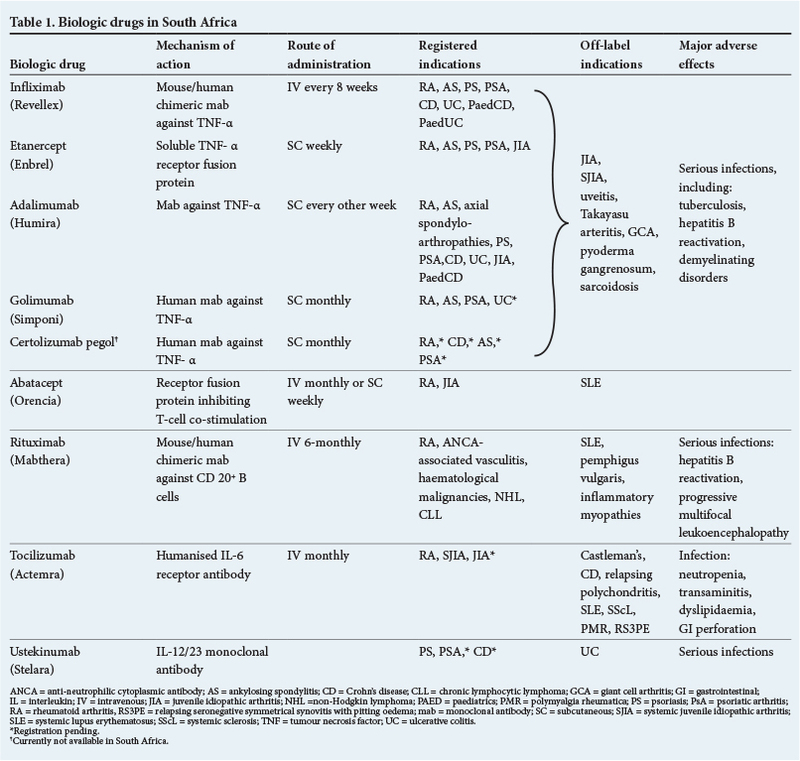 Nine biologic drugs are currently available in South Africa (SA) - all showing good efficacy and safety profiles. Their high cost and potential adverse events preclude them from being used as first-line agents. They are therefore indicated for severe disease refractory to standard therapies, and their use must be initiated by a specialist. The most important adverse effect of this class of drugs is infection and, in SA, tuberculosis is of particular concern. As new targets in the immune system are identified, new biologics will be developed. The current challenges are to optimise standard care for all patients with autoimmune diseases, and to offer the appropriate biologic to patients with refractory disease. Everyone who reads comics knows that winning is about recognising the villains, choosing the superhero with precisely the right 'superpowers' to overcome the bad guy, and sitting back to enjoy the action. The last two decades have been exciting times in the battle against autoimmune diseases. The villains have been elucidated owing to a growing understanding of the immunological mechanisms underlying the co-ordinated interaction between T and B cells and pro-inflammatory cytokines responsible for systemic inflammation, followed by the development of targeted biologic drugs with 'superpowers' against specific immune cells or cytokines. These biologic therapies have dramatically improved outcomes in patients with a range of autoimmune conditions, including rheumatoid arthritis (RA), ankylosing spondylitis (AS), psoriasis and psoriatic arthritis (PsA), and inflammatory bowel disease (IBD), as well as systemic inflammatory diseases such as lupus erythematosus (SLE) and the vasculitides. The biologic disease-modifying anti-rheumatic drugs (DMARDs) are classified according to their target. There are currently eight registered biologic drugs in South Africa (SA), of which four are tumour necrosis factor alpha inhibitors (TNFi) and four are non-TNFi, including ustekinumab, which is currently registered for the treatment of psoriasis but not for the arthritides (Table 1). Their structure is specified by the abbreviation at the end of their name: '-cept' = fusion of a receptor to the Fc part of human IgG1; '-mab' = monoclonal antibody; '-ximab' = chimeric monoclonal antibody; and '-umab' = humanised monoclonal antibody. Biologic therapies have made an enormous impact on severe RA by modulating disease activity and retarding radiographic damage, thus preventing disability. Patients with active disease despite synthetic DMARDs over at least six months can be considered candidates for biologic therapy. Seven of the currently available biologics are registered for first-line use in RA, and systemic reviews suggest that these biologics have similar efficacies. 3 , 4 The choice of drug depends on the side-effect profile, disease characteristics, patient preferences for route of administration, and cost. Because of the high risk of tuberculosis (TB) in SA, particularly associated with TNFi, biologic drugs with an alternative mode of action may be the most appropriate choice as first-line therapy5 .In addition, certain disease features may guide the choice of drug, e.g. rheumatoid factor-negative patients are less likely to respond to rituximab, and those with pronounced systemic symptoms (such as anaemia of chronic disorders, high C-reactive protein and fatigue) are likely to have a good response to tocilizumab. Methotrexate or leflunomide should be co-prescribed with biologics, except in the case of tocilizumab, where there is good evidence for monotherapy. The Janus kinase (JAK) inhibitor tofacitinib is a new synthetic DMARD with equivalent efficacy to the biologic agents used in the treatment of RA, but it is not yet registered in SA. The TNFi drugs dramatically improve the symptoms and reduce the radiographic progression of AS. Randomised controlled studies of all four TNFi have shown good efficacy in early and advanced disease. Younger age, shorter disease duration, high inflammatory markers, human leukocyte antigen (HLA) B27 positivity and minimal baseline functional disability are associated with better outcomes. 6 Loss of response to TNFi over time is well documented in AS, probably related to TNFi antibody production. In these patients, switching to an alternative TNFi may be efficacious. Other biologics (rituximab, abatacept and tocilizumab) have shown only limited success in AS. In future, secukinumab (an interleukin (IL)17A inhibitor) may be useful. In Crohn's disease, monoclonal antibodies that inhibit TNF (but not TNF receptor blockers) are beneficial in steroid-refractory, steroid-dependent, or complex fistulising disease. This induction therapy needs to be continued for at least 12 months in patients who show a response.9 The TNFi is usually prescribed together with an immunosuppressive agent, with evidence particularly favouring azathioprine.10 Similarly, TNFi are also effective for treatment-refractory, moderate, or severely active ulcerative colitis. Patients with IBD-associated axial or peripheral arthritis refractory to sulfasalazine may also benefit from TNFi. Ustekinumab has been shown to be useful in TNF-resistant Crohn's disease.11 Abatacept and natalizumab (an integrin receptor antagonist) may also be effective in Crohn's disease and trials are ongoing. Biologic drugs have greatly improved outcomes in refractory polyarticular and oligoarticular juvenile idiopathic arthritis (JIA), and TNFi have been the most widely studied biologics in these diseases. A recent systematic review demonstrated that etanercept, adalimumab and abatacept were equally efficacious.12 Refractory systemic JIA has shown good response to tocilizumab, and to IL-1 inhibitors including anakinra, canakinumab and rilonocept and encouraging study results have been reported with tofacitinib. The IL-1 inhibitors and tofacitinib are not yet licensed in SA. Despite initial optimism that biologic drugs would lead to new therapeutic options, most clinical trials in SLE have missed their primary endpoints. 13 Belimumab inhibits B-cell activation factor, which is also known as B-lymphocyte stimulator. It has been shown to reduce flares and antibody titres in mild to moderate SLE (excluding renal or central nervous system (CNS) involvement) and is the only biologic registered in the USA for use in SLE. Rituximab (for haematological, renal and CNS involvement), abatacept (for arthritis), and TNFi (for skin and joint disease) have been successfully used off-label. Despite impressive results in the majority of patients, response to a specific biologic drug is unpredictable and up to one-third of patients with an autoimmune disease requiring biologic therapy have a poor response or lose their response. These patients may respond to switching to another biologic drug. The search for biomarkers to allow optimal selection of biologic drugs is ongoing. Given the costs and potential adverse effects, withdrawal or reduction of biologic therapy is a goal of many patients and physicians. In RA, AS and PsA, this may be possible in a subset of patients who have achieved long-term remission, particularly in those with early disease, and studies are ongoing. 24 In the case of IBD, withdrawal of TNFi therapy in patients who have been in clinical remission ≥12 months appears safe in the majority of patients. One of the major problems restricting biologic use in SA is their cost, ranging between R110 000 and R160 000 annually. Offset against this cost is the benefit of early disease control, thus reducing the impact of the disease on functional capabilities and work productivity. A recent French study demonstrated that even though early biologic therapy in RA was costly, it resulted in lower health-associated costs (including physician consultations, investigations and hospitalisation) over a 4-year period owing to better disease control. 28 Long-term studies in SA are needed to evaluate the cost of biologics against the economic burdens of poorly controlled disease. Healthcare providers and patient groups in SA need to lobby for wider access to biologics for patients who require them, in both the private and state sectors. This might entail pharmaceutical companies offering drugs at reduced prices, greater flexibility by medical schemes for patients with limited cover, and the use of biosimilar drugs. Biologic registries are a major source of efficacy and safety data, and a registry of rheumatology patients who are on biologic therapy has been in operation in SA since 2008. A recent paper describes the SA experience of TNFi therapy in RA, showing results similar to those seen elsewhere in the world. 29 Further clinical research, using the epidemiological data from the SA registry, will help to develop evidence-based treatment guidelines with regard to TB risks and latent TB detection, strategies to monitor patients on biologics, and long-term cost-effectiveness of treatment. Ben Parker, uncle to Peter Parker aka Spiderman, remarked 'With great power comes great responsibility'. So it is with biologic drugs. As our knowledge of the underlying mechanisms of autoimmune diseases expands, we can expect more targeted therapies to be developed. Our growing experience with biologics and their adverse events will include development of clinical and laboratory biomarkers to allow selection of optimal therapy for each patient. The current and future challenges in SA are to optimise the standard care for patients with autoimmune diseases, with careful selection of patients with severe refractory disease and provision of the appropriate biologic drugs.